We are now on our third month of meal planning, and this month was by far the easiest to map out. As we created the newest plan we realized there are meals we want to eat more often (breakfast for dinner) and others we will no longer schedule every month (chili). Meal planning was once intimidating to me but now it is easy. I couldn't be happier with how it is going. An awesome result of our meal plan is that we are saving money. I have kept a budget for as long as I can remember and part of that is tracking my spending. I was curious how much money I used to spend eating take out/restaurant food in the months before I started meal planning, so I did some math. It turns out that I would spend about $75/month on take out. I realize $75/month isn't that much, but the majority of that spending was not planned. It wasn't special food or a treat. It was mostly "I need food and we don't have any" spending. With the meal plan in place we haven't had that desparate need for take out, so we saved money. So what to do with the money I used to just blow on take out? I bought a book series I really wanted to own. I am a very frugal person so most of the books I read come from the library. I am happy to borrow a book and return it, as I don't really have the desire to own everything I read. But there are some books I want in my house permanently. 1984 is one such title. The Harry Potter series is another. 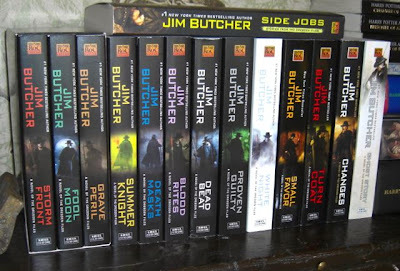 And over the past two months, with the savings from meal planning, I picked up Jim Butcher's Dresden's files. Now I can re-read them whenever I want, John can start reading them too, and they look really pretty on my shelf! 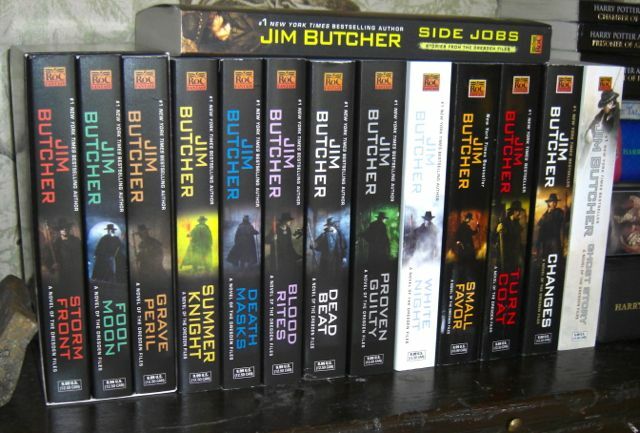 Yay Dresden Files! For some reason, we're missing the second most recent one, but I'm sure we'll get it soon. I still haven't managed to read the actual most recent one - I have too many library books that need to be finished & returned first! Our library didn't get the new one yet so I haven't read it either. I haven't finished reading the book of short stories (Side Jobs) so I have that to tide me over until they get it. Plus I have been reading lots of library books lately - I currently have four on the go! I'm doing lots of reading this year! Love it! Love saving money on food. Fantastic work. Thanks! It is a great feeling! !